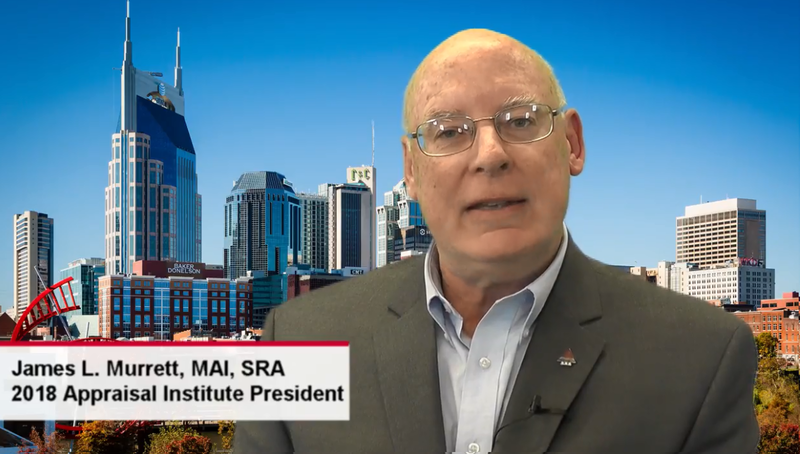 In the Appraisal Institute’s latest video, 2018 President James L. Murrett, MAI, SRA, shares the exciting opportunities attendees of this year’s conference will have to learn, network and experience all Nashville has to offer, while staying in the brand new JW Marriott! The theme for this year’s event is “Setting the Stage for Success.” Hundreds of real estate professionals from across the U.S. and around the globe will be in attendance, along with dozens of knowledgeable presenters, 30 educational sessions, exhibits of cutting-edge valuation products and services, an awards luncheon, networking with colleagues and opportunities for exploring Nashville. This year’s keynote speaker will be Alison Levine, a best-selling author and mountain climber focused on leading teams in extreme environments. Levine, the team captain of the first American Women’s Everest Expedition, asserts that the principles that apply to the world of extreme adventure also apply to demanding business environments. Having skied across the Arctic Circle to the geographic North Pole, her work demonstrates how progress can be made going backward, why egos are a good thing and how complacency can kill you. Join the conversation about this year’s conference by using the hashtag #AIConf18! Watch the video below and register for the 2018 Appraisal Institute Conference here.